Water plays a major role in food production, and as a consequence, wasted food translates to an enormous amount of water being wasted. According to the World Resources Institute, an environmental think tank, inside the 1.3 billion tons of food wasted every year worldwide is 45 trillion gallons of water. This represents the equivalent of 24 percent of all water used for agriculture. All foods have a water footprint - the direct and indirect water that goes into producing a certain food - although some footprints are larger than others. In general, fruit, vegetables and dairy account for the most amount of water lost in wasted food, primarily due to the higher water content in the product, compared to cereals or meats. For example, in 2010, consumers wasted 25 percent of every pound of apples, which ultimately translated to 25 gallons of wasted water. The genetically modified non-browning apples that came to market in Fall 2017 could help reduce the amount of wasted food, and consequently, wasted water. Globally, the United Nations estimates that about one-third of food produced becomes waste, approximately 2.9 trillion pounds per year. Food losses and their prevention have an impact on the environment, food security for poor people, food quality and safety, and economic development. The exact causes of food losses vary throughout the world and are dependent on the specific conditions and local situation in a given country. In the developing world, 40 to 50 percent of all crops are lost to pests, crop diseases, or post-harvest losses, adding up to a total loss of 630 million metric tons of food wasted or lost. Through a variety of options, GMOs can help reduce food loss in the developing world. In developing countries, food losses occur in the production chain and hit smallholder farmers the hardest. FAO estimates that 30-40 percent of total production can be lost before it reaches the market, due to problems ranging from improper use of inputs to lack of proper post-harvest storage, processing or transportation facilities. These losses can be as high as 40-50 percent for root crops, fruits and vegetables, 30 percent for cereals and fish, and 20 percent for oilseeds. Contrary to countries in the developed world, where a significant percentage of food waste occurs after reaching the market, food waste and loss in developing countries occur mainly in early stages of the supply chain, such as the growing season and during harvest. 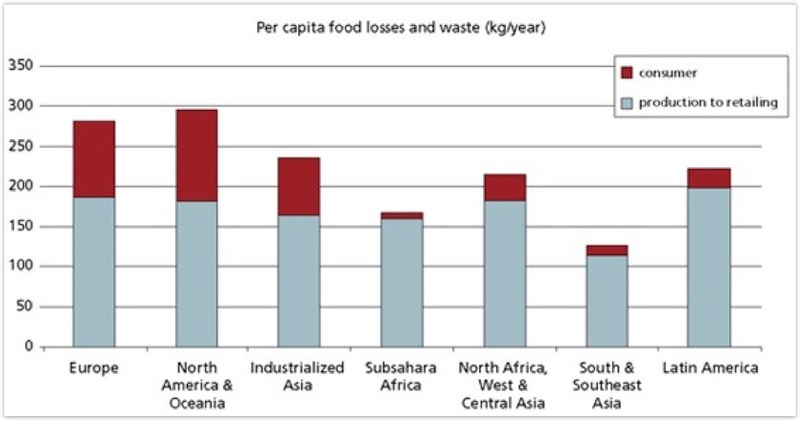 Losses of crops to pests, extreme weather patterns, and poor soil conditions are all major contributors to food loss and waste in developing countries. Helping to provide solutions to problems in these three areas could help to small-grower farmer, households, and economies in these countries. In developing countries, where resources to effectively control weeds and insects are often limited, GM traits, such as insect resistance and herbicide tolerance, have increased yield substantially. GM traits can also help farmers produce crops that are more resistant to extreme weather conditions. In recent years, several extreme weather disasters around the world have significantly damaged regional crop production. Scientists have found that drought and extreme heat reduced crop yields by as much as 10 percent between 1964 and 2007. They also observed approximately 7 percent greater production damage from more recent droughts and up to 11 percent more damage in developed countries than in developing ones. Today, through advances in crop biotechnology, GMOs like drought tolerant corn can help farmers minimize losses associated with extreme weather events. In general, while food waste and loss is a global issue, there are variations in how this waste and loss is manifested based on the economic development of the region. In developing countries, where a majority of food loss is in the field, implementing and developing new GM technologies can have a tremendous impact in the fight against food loss and strengthening economies.